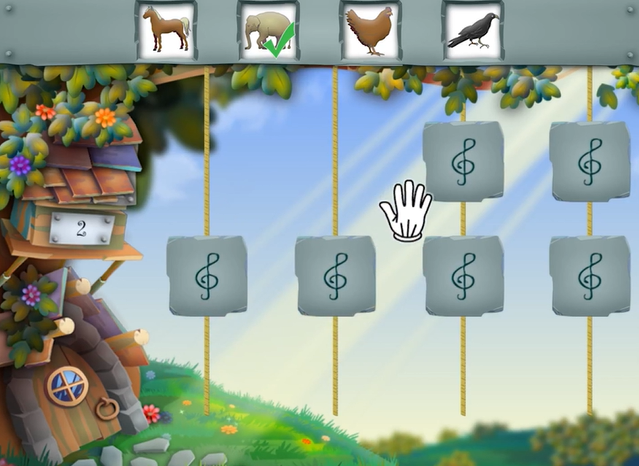 “The Melody Tree” game aims at increasing children’s concentration and audio-visual memory in a unique way. A child tries to recognize and find the matching pairs of sounds that are hidden at melody keys which are hanging in a melody tree. The sounds can be heard and revealed when the child keep the hand still for few seconds on a melody key. The game supports children’s audio memory training and linguistic development at the same time. The sounds are categorized into different conceptual categories (e.g. animals, weather, instruments, melodies, sound motifs, etc.) that can be chosen by the teacher.